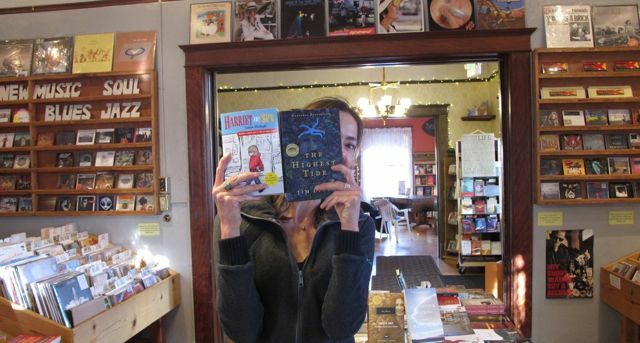 Christine is the owner of Sundance Books and Music in downtown Reno, the silver state’s largest independent bookstore. I was privileged to spend some time with this wonderful woman as she’s the focus of the latest edition of Nevada’s Hidden Stories, an occasional series produced by me for Nevada Humanities and Reno Public Radio which sheds light on the unique people, places, and communities that make Nevada the place called home). Incidentally, I asked Christine for her top book recommendations. Here I am with my newly purchased copies of her picks – Harriet the Spy by Louise Fitzhugh (which was a present for my niece) and The Highest Tide by Jim Lynch, a luminescent tale of an sea-loving boy’s coming of age in Puget Sound.